Wesley Stromberg is an American singer and composer. He is best known as the lead vocalist of the pop rock trio Emblem3 (2007-2017). Emblem3 released their first single “Chloe (You’re The One I Want)”, in 2013, and released their debut album “Nothing To Lose” in July 2013. 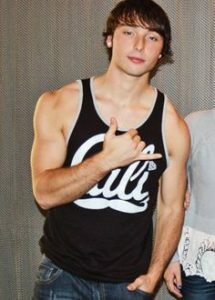 Born Wesley Trent Stromberg on December 6, 1993 in Sequim, Washington, he is the son of Grammy Award-nominated producer William T. Stromberg. He has three siblings: a brother, Keaton and two older sisters, Brianna and Brooke. At age 6, he was introduced to the guitar at age six and was writing his own music by age 11. He competed on The X Factor with the band Emblem3 alongside his brother Keaton, and signed to Columbia Records. *He was born on December 6, 1993 in Sequim, Washington. *He was introduced to the guitar at the age of six. *He was a finalist on The X Factor with the band Emblem3 alongside his brother Keaton and his friend Drew Chadwick. *Emblem3 finished 4th on the 2012 season of The X Factor. *His favorite movie is The Fault in Our Stars. *His favorite song on his band’s EP “Nothing To Lose” is “3000 Miles.”.